Trained in classical and jazz piano, playing as a teenager in R&B bands, then recording soulful jazz for the Prestige label as a leader, then switching to the Blue Note label, Larry Young records one strong album after another, including the innovative 1965 Unity album with Woody Shaw, Joe Henderson and Elvin Jones which includes a progressive jazz version of the exuberant victory march from Zoltan’s Kodaly’s opera, Háry János. Young’s 1967 release, “Contrasts”, may not have the stellar personnel of Unity (Larry picks fellow Newark musicians that he knew or played with previously), but the musicianship and chemistry is excellent, and though “Contrasts” is not the classic that “Unity” is, it provides a magnetically engaging first side, and a diverse second side that includes a particularly evocative vocal sung by Althea Young (his wife, which as far as I know appears only one one other album, Young’s next Blue Note album), and ends with a free jazz track, “Means Happiness”. Per the liner notes, Young was particularly fond of this last track, which is based on the word “Hogogugliang.” Unfortunately, an internet search on this term returns no matches, and I can find nothing that elaborates on the purpose or meaning of this track, except for the liner notes, which simply just indicates that “Hogogugliang” means happiness and is derived from Eastern thought. All compositions by Larry Young except as indicated. 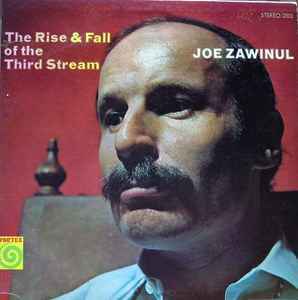 Recorded in the latter part of 1967, beginning on October 16th, the “Rise and Fall of the Third Stream” is a thoughtfully composed and arranged album with a non-traditional string quartet (one bass, one cello and two violas), Joe Zawinul on piano, prepared piano, and electric piano, the composer, William Fischer on tenor sax, Jimmy Owens on trumpet, two hard bop jazz drummers, and classically trained Warren Smith on percussion. Third Stream is the term composer Gunther Schuller coined for music that blends elements of jazz and classical together, or in Schuller’s words exists “about halfway between jazz and classical music”, including jazz-like improvisation. Although the title of this album seems to show a disdain for this term, the music embraces the concept fully, in the very best sense. This is an excellent album from first track to last. Love both Larry and Joe, but don’t have either of these. Shall be on the look out. Thanks! PS. I’ve jumped a decade to 1977 this week!